When bickering princes take the throne, the kingdom is split in two by a wall so that each brother rules half. The kingdom is divided and it is illegal for people to cross the wall. Since Tamala and Abalon are forbidden to see their grandmother and cousin on the other side of the wall, they decide to float over it in a hot air balloon. They work with their parents to collect materials, build the balloon, and wait for the perfect weather conditions. The family departs during the night, escapes military fire from soldiers, and surprises their relatives in the morning. This adventure is loosely based on the true story of two East German families sailing over the Berlin Wall in their own hot air balloon in 1979. 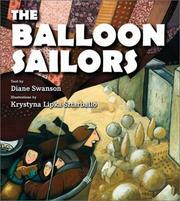 Swanson, Diana, “The balloon sailors,” Children's Picture Book Database at Miami University, accessed April 19, 2019, https://dlp.lib.miamioh.edu/picturebook/items/show/13360.